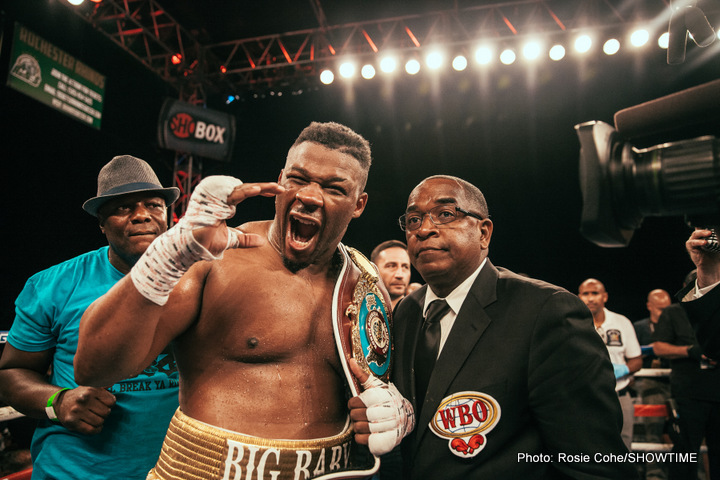 Unbeaten New Yorker Jarrell Miller has the remainder of 2018 all planned out. “Big Baby” must come through okay against former 175 and 200 pound champ Tomasz Adamek on October 6 (and almost everyone sees this match-up as a poor one, a mismatch with only one winner), but assuming he does, it will be the winner of the Manuel Charr-Fres Oquendo fight, for the WBA ‘regular’ strap, next. Miller’s co-promoter Dmitriy Salita spoke with Sky Sports and he said Miller will target a December date with either Charr or Oquendo (who fight on September 29). As relatively meaningless as the WBA ‘regular’ title is, in the grand scheme of things anyway, Miller’s plan to win it kind of makes sense. The two “real” world champions – WBA/IBF/WBO boss Joshua and WBC ruler Deontay Wilder – are both busy for the time being, and Miller can grab the secondary belt, hopefully look good in doing so, and then look for a big fight for a “real” world title some time next year. And with the WBA secondary belt around his waist, Miller would have something approaching a bargaining chip at the negotiating table. It all may look good on paper but there could be a snag. Will the Charr-Oquendo winner be able, or willing, to fight again in December, having just boxed on September 29? The winner may look to take some time off, or maybe even retire (if it’s Oquendo, at age 45, this is a possibility). Miller could then fight for the vacant WBA ‘regular’ belt, but this is all conjecture. Fans want to see Miller, arguably the best trash-talker in the game today, in the big fights. Fans want to see how good the 30 year old really is. With all due respect to Adamek and Charr and Oquendo, we won’t find out this year. But again, as a mark-time fight, Miller against the Charr-Oquendo winner is arguably passable. As long as Miller steps up and takes on the elite in 2019.